Payment types are the way to define how your customers are paying for purchases from your organization - e.g. credit card, direct debit, cash, etc. In Operate, these are defined by customizable Standard Fields. NOTE: If you are not exporting data from Operate to third party applications, you do not need to customize these fields. Otherwise, the names of these fields in Operate will need to be identical to the names of payment types within the third party app you are using; or your exports will not be added correctly within that particular app - e.g. : Quickbooks. Go to Settings > General > Customize > Accounts > Standard Fields, search for the Standard Payment Types field and click on it. Go to Settings > General > Customize > Invoices > Payment Types. By following any of these two paths, you will reach a list of all active payment types in your Operate. To add a new payment type, click the New button, found on the top left of the list. Next, enter your payment type information: Give it a name, add an invoice text that will be displayed on your invoices when this payment type will be used; tick the box if this is a bank transfer type of payment and choose the currency. Click Save when you are ready. To edit an existing payment type, click the pencil icon next to it. Now edit the payment type information and if you are exporting from Operate to a third party app, make sure that the name matches the one in your app. For example, if the name of the payment type is Cash, and the software you are exporting to lists Cash Payment, make sure that the name in Operate is also Cash Payment, by renaming the payment type. You can also rename or add the payment method in your external app - exports should work correctly as long as both apps contain identical payment methods. Click Save when you are happy with the setup. There are two easy ways to delete a payment type. In both cases, you will be asked to confirm your choice. Select the payment type that you want to delete, by ticking the box next to it, then click Delete on top of the list. You can use this method to delete multiple payment types in one go, simply by ticking the boxes next to the ones you want to remove. Click the red "x" next to the payment type you want to remove. This method can only be used to delete one record at a time. To quickly update one or more payment types in one go, select the records you want to update, by ticking the boxes next to them, then clicking Update at the top of the list. Here is where you can select to update the currency or invoice text; or tick the box that marks the type as included in bank transfers. 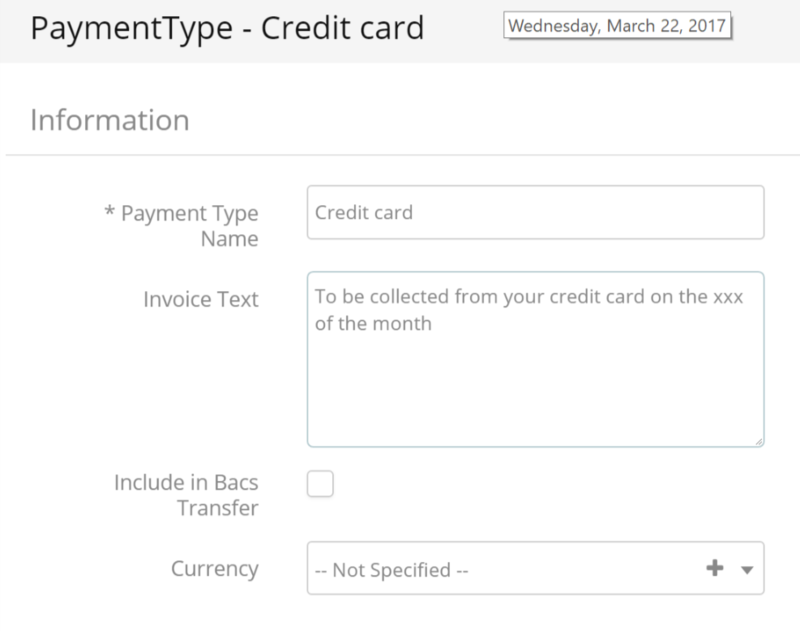 Using the Invoice Text box on the Payment Type record, you can set your invoices to mention specific terms, according to the customer's chosen payment type. For this you need to add a merge field to the Invoice Template you want to use. Then, search for payment type text under Select Merge Field. Rental Payment Type Text - this fields inserts the text added to your Rental Payment Type, which you can select on the Account record. (Please see the Billing section of the dedicated article.) So, for example, if your Rental Payment Type is Direct Debit, this field will show the text entered onto the Direct Debit Payment Type Record (configured under Settings > General > Customize > Invoices > Payment Types, as shown above. Standard Payment Type Text inserts the text entered within the Payment Type record selected as a Standard Payment Type on your Account record., the same way as the Rental Payment Type. Depending on the type of invoice you are editing, you can use one of these fields or both. Once you select your payment type text field, simply place your cursor wherever you want to place the field onto the template, then drag the field here. Save your template when ready. Next time you use this invoice template, the text entered onto your Payment Type will appear onto the invoice itself.